Because interviews are so important to your mission success . . . it's vital you get the interview right. More specifically, it's vital that you get it right the first time! Donors won't be too happy if you contact them over and over again to ask something you should have captured during the initial interview. Their time is also valuable and must be respected. They're doing you a favor by granting an interview with you so don't mess it up with weak procedure. 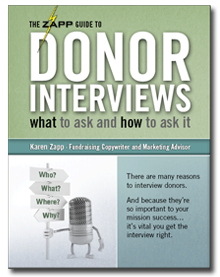 In The Zapp Guide to Donor Interviews you'll find out what you need to know in order to do the interview correctly, including the questions to ask! Why bother with donor interviews? Interviews with donors are a dynamite source of valuable content. Specifically, content that other donors value. Content that is relevant to the magnanimous people who support your mission. The insights you gain from interviewing donors will result in donor-centric copy. You can incorporate their exact words into many of your marketing and fundraising messages. How interviews can further your cause . . . how they help you raise more funds. Did you know there are at least 14 ways you can use and leverage interviews throughout your fundraising, cultivation, and marketing communications? During the interview it's essential that you put the donor at ease. I share several tips on how to put the donor at ease so they give stronger answers. Tips and guidelines on how you should prepare for an interview. The A-B-C's of how to have a successful interview; what to do. Over 2 dozen generic, all-purpose donor interview questions. Guidelines on how to probe for the answer from the heart . . . the real reason . . . the dynamite answer you need. Seldom will their first answer be complete. You need to dig for the good stuff. Find out how to do this. No two interviews are identical. There's always a need for custom questions - questions that are only asked of one person - so you'll find plenty of suggestions on how to develop custom questions to augment the generic ones. Plus there are two examples to illustrate exactly how it's done. What is one of the most effective ways to put a donor - or anyone you interview - instantly at ease? How can you "connect" with them for an engaging, relaxed conversation and interview? This "big tip" is found on page 15. This 16-page report is packed with the information and resources you need to conduct a successful donor interview. Within these pages are the questions to ask, plus the steps you need to take to prepare for and to complete an interview the right way.